This article seems freshly relevant to me as I have been thinking about the latest press release onslaught by GPT advocacy group, Northwest Jobs Alliance, headed by President Brad Owens, Chair John Huntley, and Director Craig Cole (Cole is also a paid consultant for SSA Marine/PIT). I find their efforts to influence the Army Corps of Engineers to diminish and/or abrogate Lummi Nation’s treaty rights, especially with unsubstantiated accusations, are what I perceive to be an Anti-Indian campaign. Treaty rights are the supreme law of the land and that law becomes a conduit whereby Native Americans can invoke the promises to uphold rights they never ceded that were made to them in those treaties. By any standard of basic fairness, the U.S. Army Corps of Engineers should not allow itself to be manipulated into aiding in what would amount to a devaluation and confiscation of privately-owned, non-tribal lands. Please publically [sic] disassociate yourself from this scheme, ensure the normal EIS process is completed*, and encourage the Lummi to engage in good faith discussions with the proponents of GPT to explore win-win possiblities. That’s only just and reasonable. Now, time to copy and paste and send this in a letter to the Army Corps, and our Washington Representatives! Read Sandy Robson’s article “What Would Corporations Do? Native American Rights and the Gateway Pacific Terminal” here. Read Zoltán Grossman’s “Treaty Rights and Responding to Anti-Indian Activity” here. 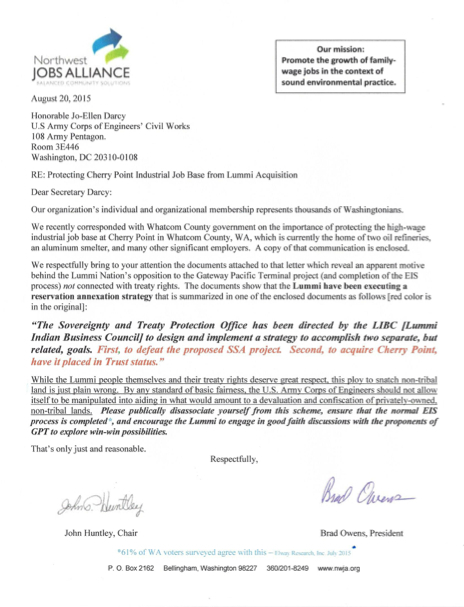 This entry was posted in Commentary, Information and tagged Brad Owens, Coal, Craig Cole, Gateway Pacific Terminal, GPT, John Huntley, Lummi Nation, Native American Rights, Northewest Jobs Alliance, Treaty rights, Trust Responsibility, U.S. Army Corps of Engineers, USACE. Bookmark the permalink.